She [Tiarna] brings with her plenty of experience after playing in a premiership side and will play a role in the development of our younger players. 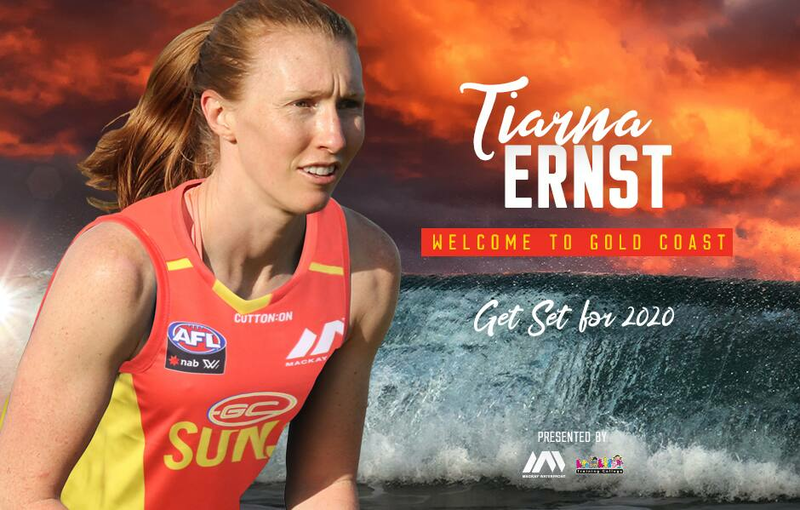 The Gold Coast SUNS are excited to announce the signing of AFLW premiership player Tiarna Ernst. Ernst joins the SUNS from the Western Bulldogs where she played 22 games in three years. An AFLW player by day and doctor by night, Ernst specialises in obstetrics and gynaecology, delivering babies and caring for women during pregnancy. The 31-year-old, 180cm defender played in the Bulldogs’ 2018 AFLW premiership and has been a stalwart in defence for the Dogs. Gold Coast Head of Women’s Football Fiona McLarty said the signing of Ernst on a one year deal gave the club some much-needed experience. “Tiarna is a great player but an even better person so to be able to get her into our football club is a fantastic result,” McLarty said. “She brings with her plenty of experience after playing in a premiership side and will play a role in the development of our younger players. Ernst becomes the fourth player to commit to the SUNS in the AFLW Sign & Trade period and the seventh member on the AFLW list for 2020.